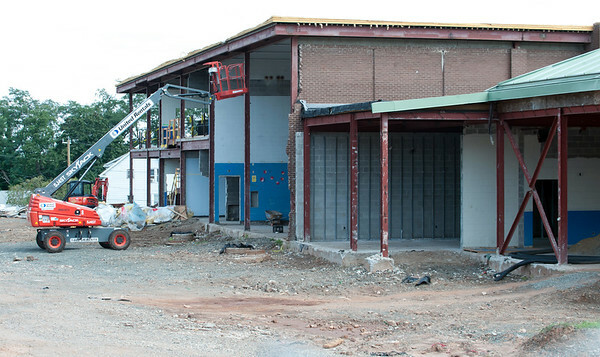 NEW BRITAIN - A portion of the $53 million Smalley Elementary School renovation project is stalled after a contractor filed a lawsuit against the city, claiming favoritism was shown in awarding the contract to put a new roof on the building. Silktown Roofing Inc. contends in the lawsuit filed July 24 that their bid came in higher because it was calculated on the exact specifications for the new roof, including more expensive materials in a customized color. The bid winning for the $1.1 million roof replacement went to Elite Roofing and Reconstruction which came in at about $30,000 lower than Silktown, court papers said. Silktown is now claiming that the city used favoritism in the selection of the roof contractor, the lawsuit said. Attorneys on both sides are expected to present evidence Thursday during a hearing at New Britain Superior Court on whether a temporary injunction barring any construction on the roof should be issued. A judge ruled Aug. 13 that work couldn’t go forward until a court has determined if there was enough evidence to put an injunction in place. The roof is part of an extensive renovation of Smalley School that started in May. Students are attending the former Pope John Paul II School while the renovation is taking place. The project will essentially revamp the school, with new parking lots, more classroom space and an updated, modernized look. The renovations are expected to be complete in time to allow students back in the building for the 2019-20 school year. The price tag for the entire project was put at $53 million, with the state kicking in about 80 percent. Paul Salina, the school district’s chief operations officer, said on the day of the groundbreaking that he expects the cost to come in closer to $45 million. The bidding process for the roof renovation opened on May 30. The contract was awarded to Elite on June 20, Bradley said. Attorney Lawrence Rosenthal, representing Silktown, said in the lawsuit that, during the bidding process, Silktown called the project manager to clarify whether the bid should include a particular type of material in a particular color, even though the materials were more expensive. Rosenthal did not return a request for comment from The Herald Friday. According to the lawsuit, the project manager told Silktown that the bid should include the more expensive materials. Silktown later found out that the winning bid, which went to Elite, did not include the more expensive materials, the lawsuit said. After being made aware that they had not been chosen for the roofing project, Silktown requested that the city disqualify the two bids that came in lower than its own, based on what it had been told by the project manager. The city refused, saying it had chosen the lowest bidder, the lawsuit said. Posted in New Britain Herald, New Britain on Sunday, 2 September 2018 20:55. Updated: Sunday, 2 September 2018 20:58.